Some frees or bargains for Halloween. Home » GO DUTCH ! » Some frees or bargains for Halloween. Posted By Katia Millet on Oct 29, 2018 in GO DUTCH ! With Halloween coming up on Wednesday it is time to get ready and get some scary or elegant outfits, make up and jewelry fitting for Halloween. I found some awesome frees or dollarbies for you on Marketplace and in Second life stores, so here it comes. The awesome skin appliers today are as usual by 7 Deadly s[K]ins. I am wearing the gorgeous Lane Omega applier in pineapple tone. Lane is available in dark and light tones and a matching shape is available too. For just 250 L$ this light or dark pack is yours, each with 7 beautiful skin tones. I am wearing Lane on the FIRST set of pictures. On all other pictures I am wearing the gorgeous Rowyna Omega applier in pineapple tone by 7 deadly s[K]ins which you can find till October 31st at eBento. Rowyna is available in dark and light tones and a matching shape is available too. I found this awesome Dark Princess outfit by AdN design on Marketplace for 1 L$. This dress comes as Omega applier, with a prim and a flexi skirt, with the net stockings and the boots. There are even rings included, however they are NOT Bento so I am not showing those. This dress also fits classic avatars. And the beautiful make up is by Booty’s Beauty. Today I am wearing their Carried Away lashes and their Rose Petal lipsticks and their Candy Coated eye shadows. You can also choose to wear the Alma Bloody Lip lipstick appliers. They come in different appliers, I am using the Omega version on my Vista Zoe head. You can find this applier along with the other versions at the Ghee Halloween Sale for 50 L$ per applier. This sale runs till October 31st. Over to the free to buy Witch Tattoo by Mlle A & Gacha Pon-Pon. Just buy for 0 L$. Comes as Maitreya, Belleza, Slink applier and as Omega applier too. My next find is this Mesh Halloween top by Nadas which is free on Marketplace. 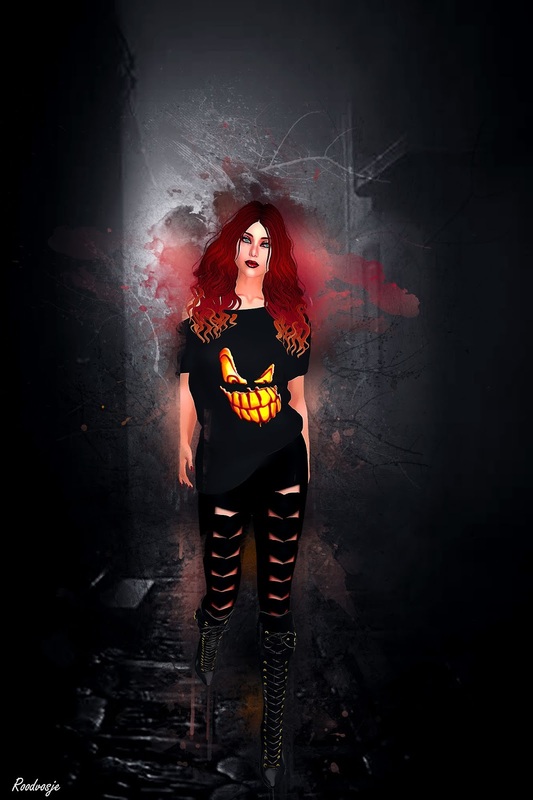 The shirt comes in 5 mesh sizes, but the included leggings are only for classic avatars. So I found these leggings by Gothica, which come as Omega appliers and which are 1 L$. The matching boots are by Heels. They are their Anna Boots. This next set is by Meraki and it is a dollarbie too (1 L$). You can find it on Marketplace and this set fits Maitreya, Belleza and Slink. The next dress is from Marketplace and it is by MB Design. This dress is 1 L$ and it is available for classic avatars, Maitreya, Belleza, Slink, TMP, eBody and Ocacin. Find the right one on the page to get the one that fits you. The cute hat is a FREE gift at Heels. There are 2 black & white pumpkins at the store, buy for 0 L$. One contains this scary hat. The cute EtoilleRose heels are also by Heels. And the last find for today is this great HelloQueen Halloween dress by WIP (Work in Progress) on Marketplace. This dress fits ONLY Maitreya and it is 1 L$. But if you have Lara, it is a great gown to wear on Halloween. The fun hair is Batty by Truth hair, which is their latest VIP group gift. The group is 350 L$ to join.